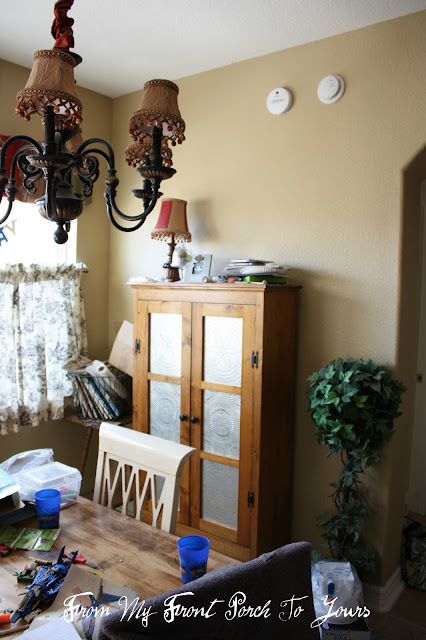 This is the breakfast nook at our first home. We always place our beloved pie safe in the breakfast area in all of our homes. I have always had a tough time decorating around it though. Here it is at our last house. Again nothing to write home about. And here it was just last week in our current home. I have never really shared pictures of our kitchen or breakfast nook because well they just were not all that exciting as you can see. Here it is just a few days ago after Oldest knocked almost everything off the top of the pie safe. This is one of my keeping it real pics folks! ;) Anyways, since that happened it started the whirlwind redesign of this space. It was just the kick in the pants I needed to get my decorating ideas flowing. 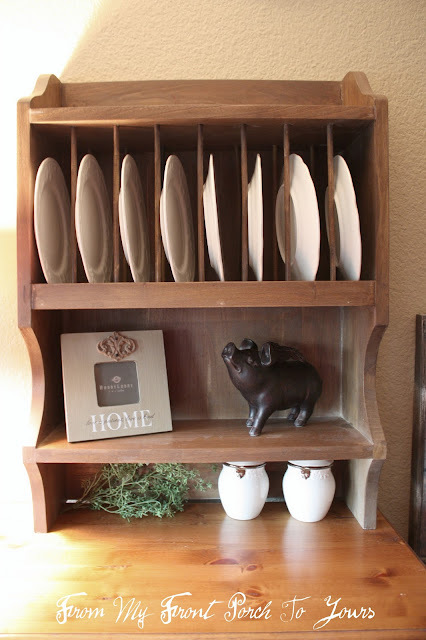 A few days ago HomeGoods had this fabulous little plate rack that I HAD to bring home. I was not sure where I was going to place it but again I HAD to bring it home! ;) Good thing too cause I had the perfect spot for it right on top of the pie safe. Who knew! 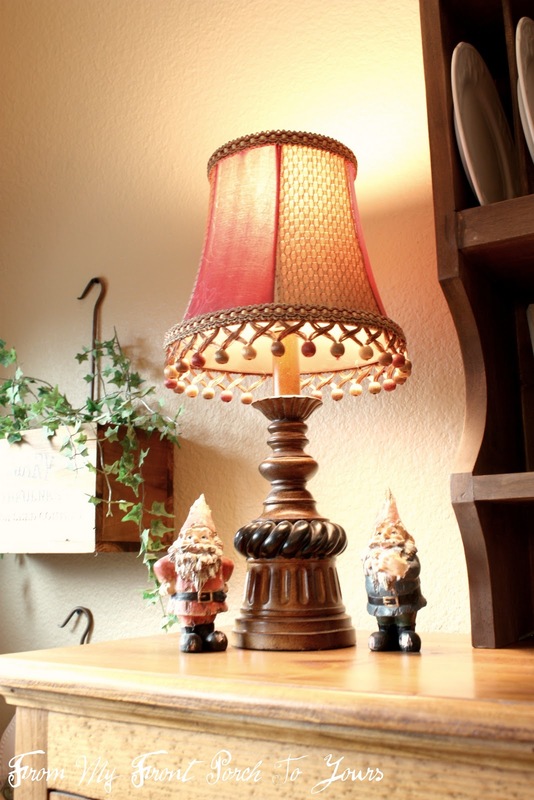 I kept the little lamp and my little Gnomes. They are quirky like me so they had to stay. Then I brought out some small white plates that I had purchased for the dinning room. I love the subtle design on them. They ended up being the only plates that would fit the piece. Then I just added a few more small accessories. Nothing major but enough. Next up came the side areas of the pie safe. I had this picture in my pile of things to take out and sell out at the cottage but I pulled it and placed it here and am so glad I did. It is perfect for this spot! This is my favorite little spot! I next pulled out a few of my herb crates and hung them on the wall. It made a perfect spot to show case The Hubster's grandmothers rolling pin! I then had the stool just sitting in the guest room and pulled it out cause there needed to be something to fill the space. Placed a little greenery in the top herb crate as the final touch. I think it worked out perfectly! Here is the whole picture! I would say much much better! Before I go though let me share a few more touches to our breakfast area since I have never really taken you on a tour. This here is my $10 brass chandy I purchased back when we first moved in. I painted it up and made it showcase worthy. I love my little Welcome sign. It hangs by the back door. I brought out the large cloche that I had made from our old foyer light fixture. It use to sit on the dining room table. And I kept our blue backdoor that I had painted last summer. I was not sure about it but now I love it! 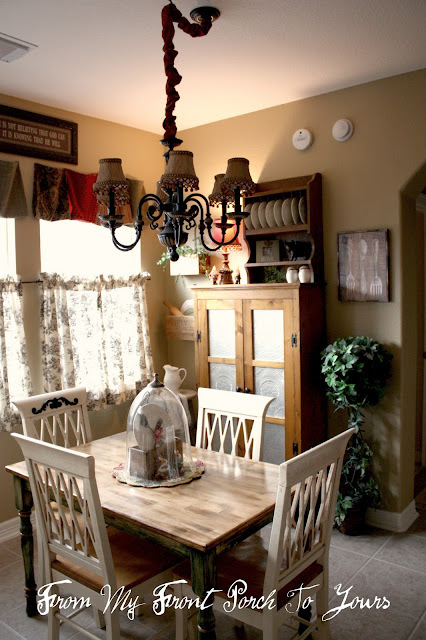 I am still needing to make one more set of cafe curtains for this area and after that this area is done! Thanx for stopping by! Hope your Monday is going well. Hi Pamela! Everything is so pretty! I love your plate rack and I agree with Sandra, your cloche vignette is so precious! It's so adorable! That's a space I would love to spend time in! I love the sweet picture with the Silverware and the Herb boxes. And the Cloche is super Fab! Beautiful job on your redo project I just love it!!! The hanging herb crates are my fav. Also love the little pig on your shelf, just precious. it looks terrific~! I love all the new pieces and details. I have had the nesting boxes over a year and never used them. Now I might.. This looks so cute love all your changes, the pig is adorable! It looks GREAT! So much warmer and more inviting. Beautiful! What a nice room! I really like how it all came together. This area is so well put together, great job! I especially love the cloche. MUCH improved...great job! The plate rack is perfect on the top! I love your breakfast nook, Pamela! Love the curtains and all your little touches. They really make it such a nice place to want to sit and have a cup of coffee, read the paper, and more. I love how everything turned out. And I adore your cloche you created! look's wonderful, love that lamp.Great job. I love the tin on your pie safe! Cute, cute, cute! Very French Country. Just darling! That fits perfectly on top. I love your homey breakfast nook. 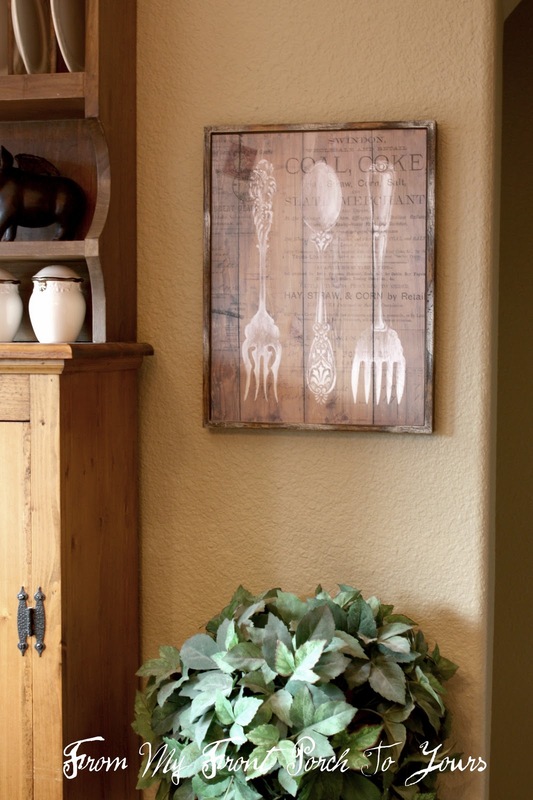 The changes and additions you made to your breakfast room are perfect to bring it all together. Really like what you did. The room makeover is wonderful. Just love your pie safe. I have one too and love it..
Beautiful, Pamela !! I love the pie safe ... the welcome sign ... the vignette under the cloche ... all of it !! Thanks for sharing !! Pamela, this looks great! I love it! It is so warm and cozy and I love the wooden crates on the wall....beautiful! It's nice to meet and follow you....you have such a lovely home...it's so cozy and warm! Stop by to visit with me sometime, if you've the time. LOVE IT Pamela!! 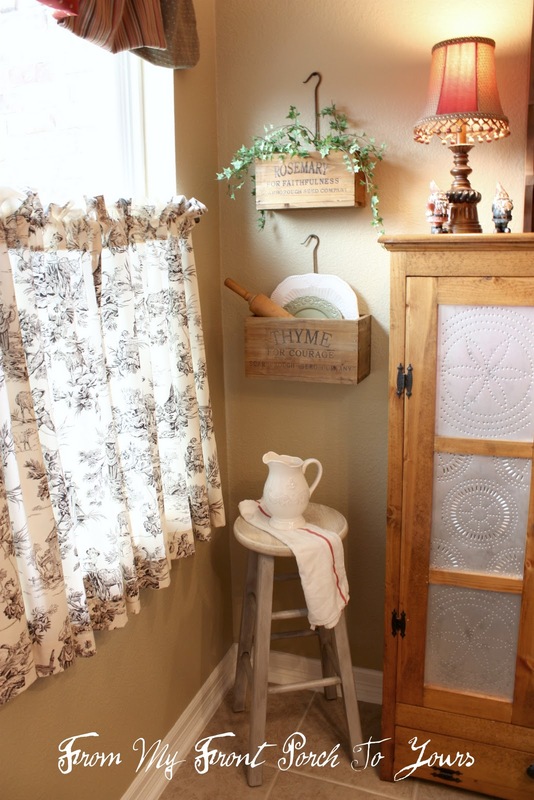 I love the area you created around your pie cabinet and the pretty vignette on top, love your cloche centerpiece too! Oh Pam I just love the pie safe with the shelf on top. It takes it to a whole other level and adds so much dimension - perfect! I like the cloche you made and enjoyed your kitchen tour. Your home is cute and cozy and I love the makeover. Great piece! Love your breakfast nook. Your pie safe is wonderful. So lovely and warm and inviting! Pamela, This kitchen looks GREAT! I think its so fun that we both have pretty kitchens! I'm thinking I need more touches of interest though! Thanks for inspiring me!!! I'm excited to be your newest follower and would love to have you share the 'love' when you visit next!!! Happy to have a new bloggy friend!!! Hope your week is great! PS I'm hosting a Ramsign giveaway right now if you'd like to stop by I have a link at the top of my sidebar!!! It turned out wonderful, and the pie safe was a perfect spot for the dish rack. I'm now your newest follower. Pamela, what a wonderful transformation! That pie safe is a treasure! What a plate rack, I want one too. The areas around your pie safe are beyond awesome, the overall look is so creative and oh so, charming!! Pamela, what a great way to decorate around your pie safe. It all looks like it was meant to be! I love it! So very pretty! I love what you did with your chandy and the little welcome sign. Thanks for sharing. I am in love with the cloche centerpiece. All of the pictures are wonderful. I love it if you could share this wonderful post at our What's It Wednesday linky party.